Symbols are useful things. They provide a focus for certain thoughts and feelings; they serve as a rallying object and badge of membership. Under current circumstances I have felt a need to draw to me and display symbols of peace and freedom. This started me on a journey to discover what symbols there are. Also, I began to think about what each particular symbol fully represented. One of the most recognised symbols of peace is the dove. Its origins are from the story of Noah and the Ark. When the rains that flooded the earth stopped pouring down, Noah sent out various birds to see if they would bring back any sign of land to his boat. He was anxious to begin life again on dry pasturage. One dove eventually returned carrying an olive branch. This story seems to be more about hope than peace. Of course the reason Noah is on the ark is that the divine being decided humanity was wicked, and should be entirely wiped out with the exception of Noah and his family. Sadly, this corresponds too closely with the attitude that if we could only wipe out all the bad people, then we could have peace. This is disappointing for I do find the image of a beautiful white bird, which can fly across borders without concern, a compelling one. Within Asia the white crane is the bird of peace. Originally it was the sort of peace that comes with prosperity and friendship, such that war is not even considered. The crane took on even greater significance as a peace symbol within Japan right after the bombings of Hiroshima and Nagasaki. In 1955 a little eleven year old japanese girl named Sadako Sasaki was diagnosed with leukemia from exposure to nuclear radiation. She heard that if she folded a thousand paper cranes, she would be granted a wish. So she began wholeheartedly folding one crane after another, wishing for a well body within a world of peace. Sadly, she died within the year, but her story went out to the people of Japan and eventually to the world. Now an organisation has been founded in memory of Sadako whose purpose is to unite children in the effort for peace. You can read more about The World Peace Project for Children at <http://www.sadako.org>. Though it is still not well known, I quite like the white crane as a symbol of peace. Probably the other most recognised symbol of peace is the "peace symbol". Many people are unaware of its origins, and I even heard that its shape was meant to be the footprint of a dove within a circle. In actuality it was originally the symbol for the Campaign for Nuclear Disarmament <http://www.cnduk.org>, a British peace group. The shape was determined by the arm positions for ND in semaphore. Gerald Holtom created the symbol in 1958. Very soon thereafter it arrived in the US to be used in the civil rights marches. Bayard Rustin, a friend of Martin Luther King, Jr.'s, travelled from Britain to take part in the first Aldermaston march and brought the symbol with him. Since that time it was taken up by young people to protest the Vietnam war, but also showed up on the walls of Prague when the USSR invaded, on the Berlin Wall, and even in East Timor. The CND has carefully never trademarked the symbol in order to encourage its widespread use, even though they are not always happy with the commercial applications that sometimes arise. 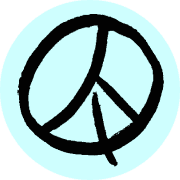 You can read a little more about the history of the peace symbol at <http://www.sims.berkeley.edu/~lcush/PeaceSymbolArticle.htm> I like how the peace symbol stands for successful campaigns for peace over war. As for symbols of freedom and civil rights I found it much more difficult to find anything satisfactory. The only two symbols that came to mind are distinctly American and have a few difficulties. The Liberty Bell was created to "Let Freedom Ring". Sadly, perhaps as an ominous omen, the very day it was completed was also the day that it cracked and has never been heard. The founders of the United States wanted to create a country where freedom reigned. Nevertheless, true freedom has rarely been smiled upon by the government or even the populace. Even now it is considered "unpatriotic" by some people to speak out against the war on Afghanistan. The Statue of Liberty is the other symbol of freedom. Lady Liberty has mostly come to represent open arms to the peoples of the world, that here is a place of refuge and freedom. She originally came to the US from France where she was seen leading the French in a war against oppression. I do not know if she is compatible with symbols of peace. So what do we do for a rallying symbol for liberty? I have created a symbol that I trust people will find useful and pass on. The image is of the sun rising out of a box. The idea is that we are better able to shine, to grow to our full potential, when we are able to live freely. I do not choose to trademark this image, but I ask that you make it clear what it stands for and where it was found, so that the origin and meaning can remain consistent. Attached you will also find an associated motto, it need not always be attached to the symbol, but does explain its rallying focus: Freedom of Thought, Freedom of Expression, Freedom of Choice, Freedom of Being. I trust this will encourage you to also select, use, and wear symbols that show your alliance to some very important ideals. Thank you for your help.